New British musicals are a rare thing at the moment and ever rarer is a successful one, which is why it is so exciting to hear that Lift is selling out the intimate Soho Theatre. The characters are identifiable and the songs are fresh and quirky. Critics may protest that the audience are not given enough of a storyline, but if there is one thing the show oozes, it is a love for musical theatre. Talking to the composer, Craig Adams, really highlights his love not just for productions, but also for the audiences. When he talks about the ticket sales for Lift and the show selling out, his pride in the production is evident, but he fears it would not suit the majority of the mainstream theatre audience. “I think the younger generation are desperate for new British musicals,” he said. “But the main audience, they’re not there yet. You have to have a smash hit. Wicked was a smash hit because it was about a popular story. Stephen Swartz hasn’t had a massive hit other than Wicked. Maybe audiences will change. I hope they do, because if they don’t I haven’t got a career,” Adams said, trying to laugh off the serious issue behind the flippant comment. But things could be more hopeful overseas. Adams thinks the Broadway audiences understand new writing better than the West End theatregoers and the show could be heading there, with producers in New York and Chicago interested in staging it. Lift runs at the Soho Theatre until February 24. It stars Julie Atherton (Avenue Q), Nikki Davis-Jones (Wicked), Cynthia Erivo, Jonny Fines, Luke Kempner, Ellie Kirk, George Maguire and Robbie Towns. Tickets are available here from £12. If lift came to Australian theatres, I’d buy every single ticket just to ensure Craig keeps his career. I wish I were able to see this musical, it’s been a favourite for a long time. Fingers crossed it heads to Australia at some point for you! Sounds like a great show, shame the run is nearly over! Never heard of this show before but its definately got me intregued! Really good show, glad I got to see it during it’s short run. This interview makes me wish even more that I could get down to London in time to see it. 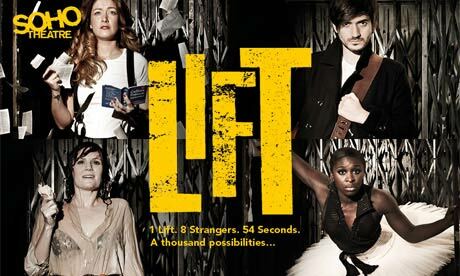 Fingers crossed this is only the continuation of the journey for Lift, it sounds like it has a future. A really great read. I was very disappointed when I discovered I wouldn’t be able to make any of the dates during its run. Hopefully it will get a second chance at an outing in a theatre as I have heard great things about the show as a whole. Craig Adams really is fabulous and having been familiar with his work for a few years thanks to his collaborations with Kerry Ellis, I very much hope this is the start of wider recognition for him. Loved this show. Great to hear Craig will be developing more shows. Great review – this show sounds awesome!